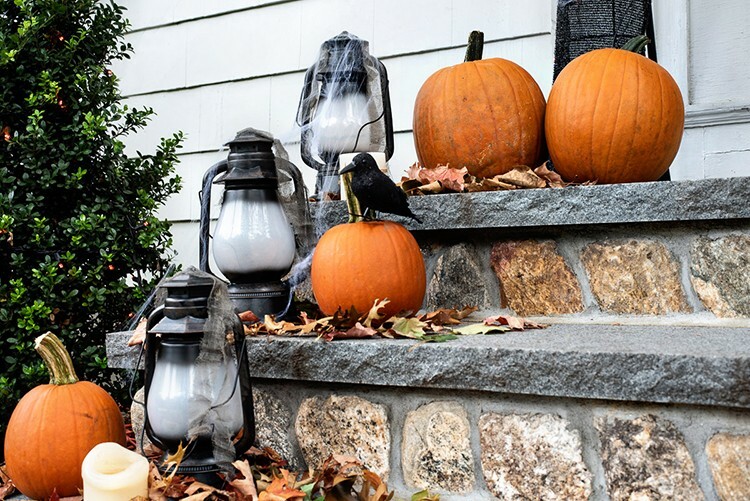 Jenna of Jenna Kate at Home has always loved celebrating Halloween. 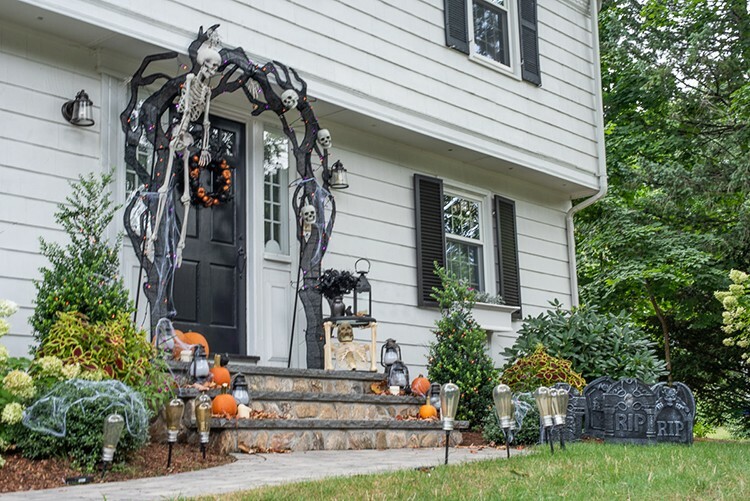 For this year’s Halloween and Harvest Style Challenge, she went all out with a front porch setup that’s especially spooky at night! Since I was a kid, Halloween has always been one of my favorite holidays. First, my birthday is November 1, so I always celebrated it on Halloween with a costume party. 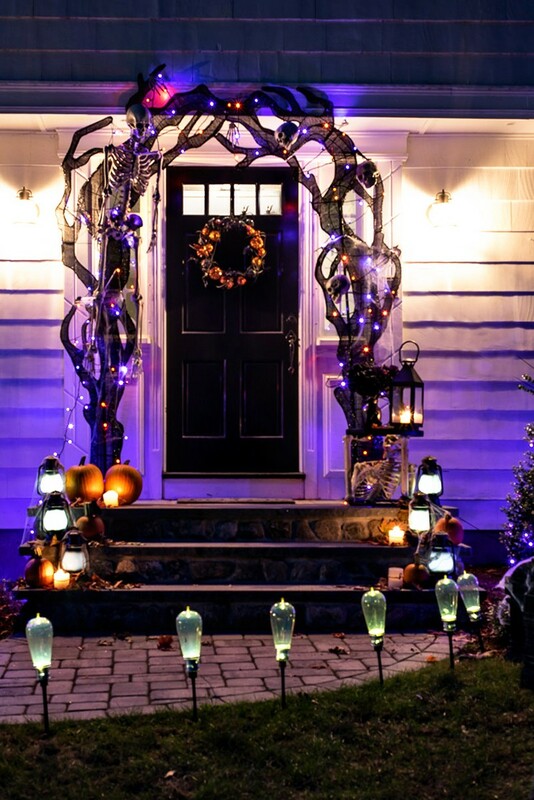 Secondly, Halloween allows my love of scary movies to marry my first love – decorating. So of course, when The Home Depot asked if I’d like to participate in this year’s Halloween & Harvest Style Challenge, my answer had to be yes! 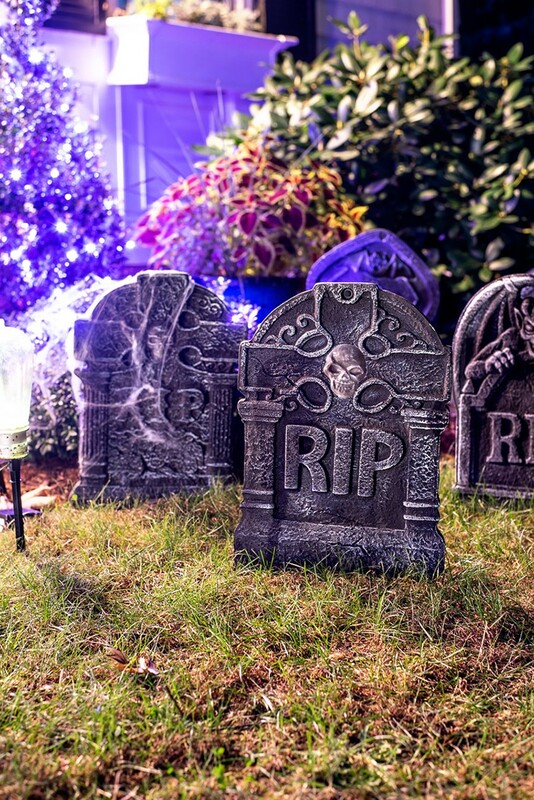 While I don’t go crazy inside the house with Halloween decorations, I do enjoy decorating outside our house for the trick or treaters. The kids appreciate the effort and I’m happy to be the cool (or scary!) house on the street. 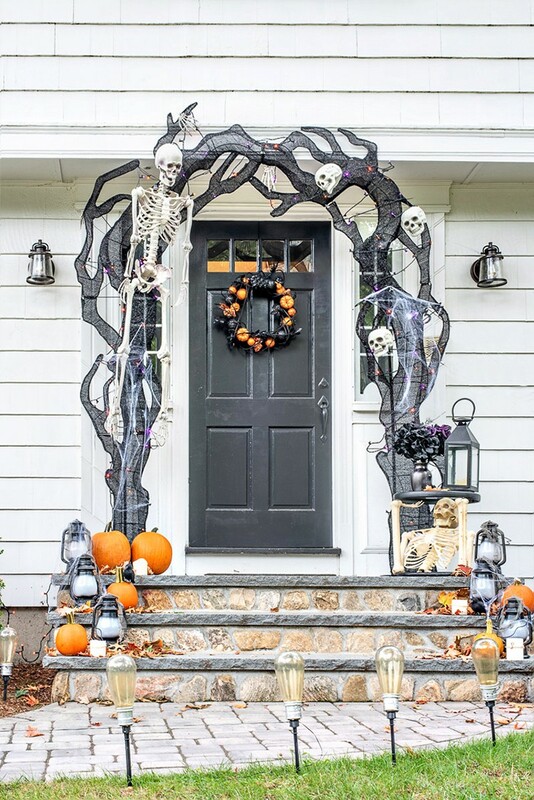 My 4 year old is now at an age where he understands decorating for Halloween and he was so excited to help me pick out decorations from the Home Depot this year. 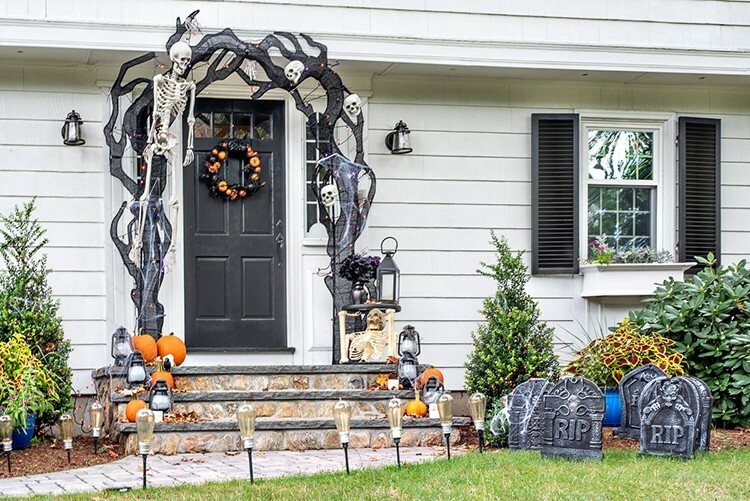 There’s such a huge selection available to purchase but his favorite item was this Skeleton Arch, so that was the beginning of my vision for this space. 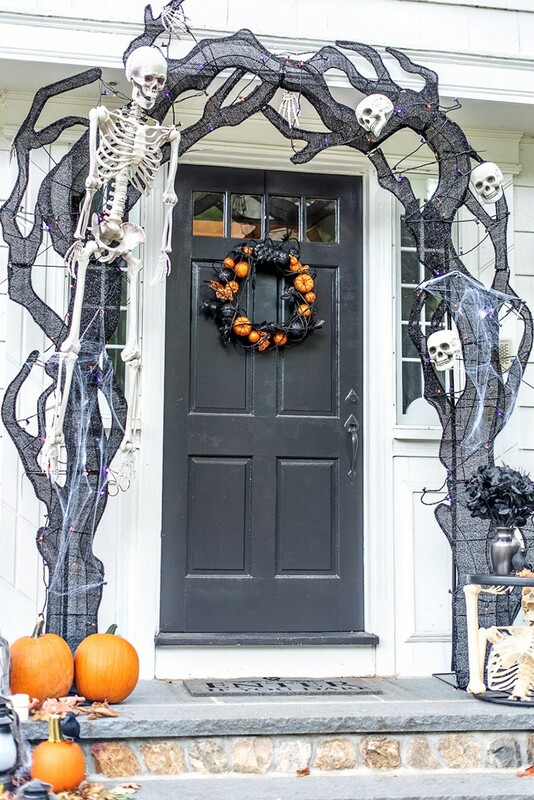 The arch really frames our front door and I think in no uncertain terms screams Halloween! I assembled the entire arch myself (it was very easy to do!) but when it came to actually standing it up and getting it over our front steps, I needed help. At only 5’2″, this 102 inch arch is considerably taller than me! 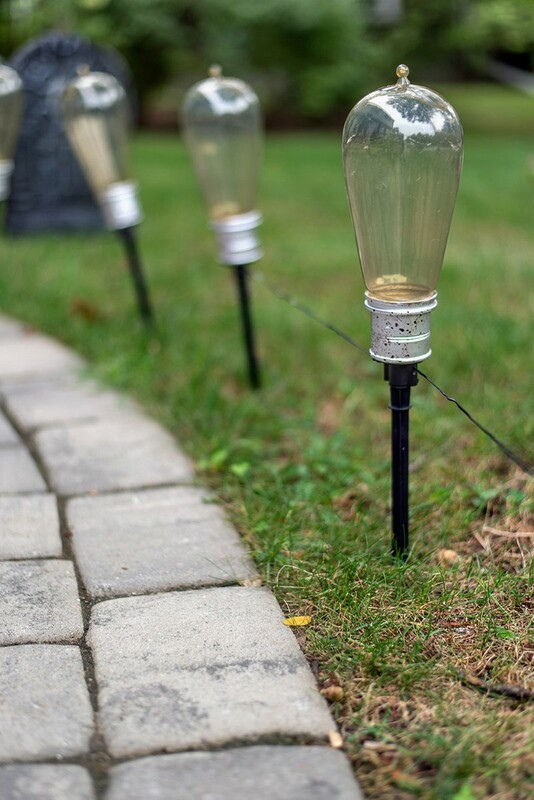 In the spirit of creating this almost “grand entrance” I thought it was only fitting to also light the pathway and these LED Bulb Pathway Markers are perfect. 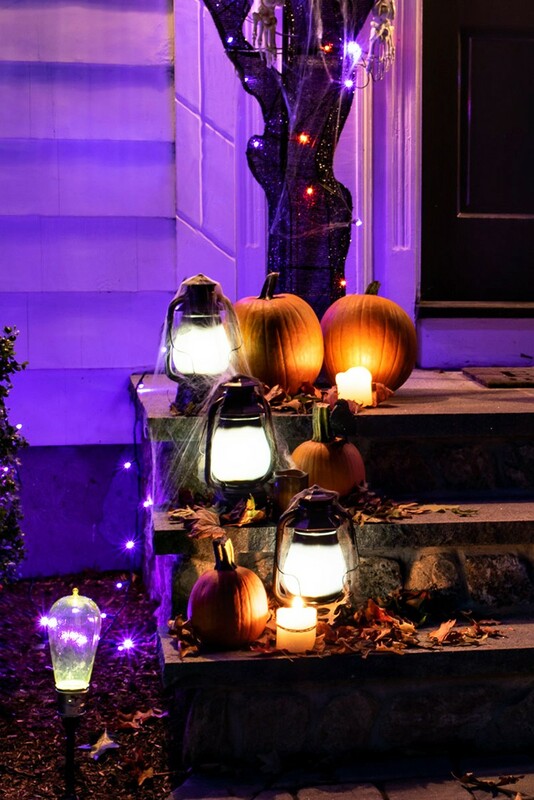 Not only do they light up but they have really creepy motion activated sound to add to the overall scary effect. 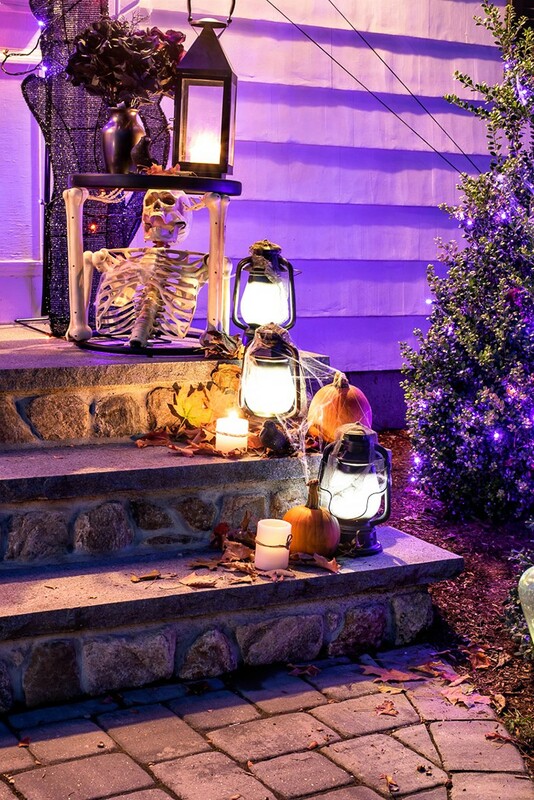 The light effects continue up the front steps with more motion activated lights and eerie sounds in the form of the Lightning Flash Graveyard Lanterns. 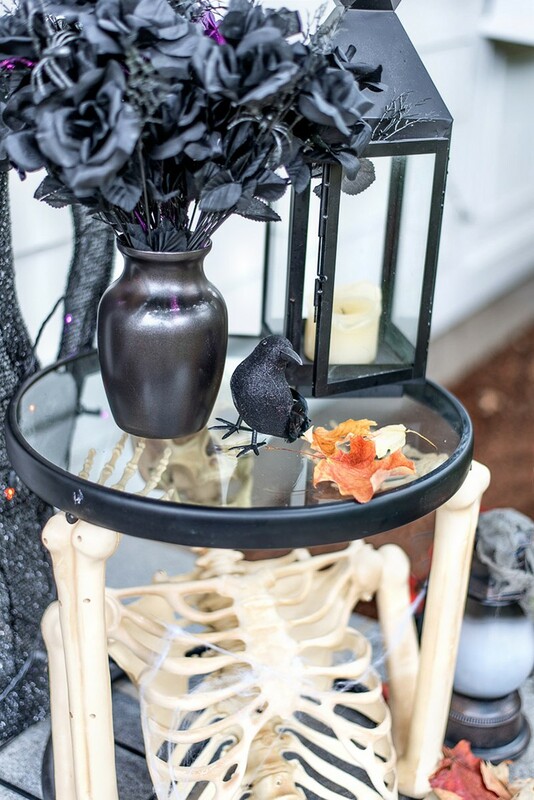 The Skeleton Torso Table is actually my favorite purchase. Isn’t it a riot?! My husband thought I had lost my mind when I opened the box and showed him but I love it at the top of the stairs. 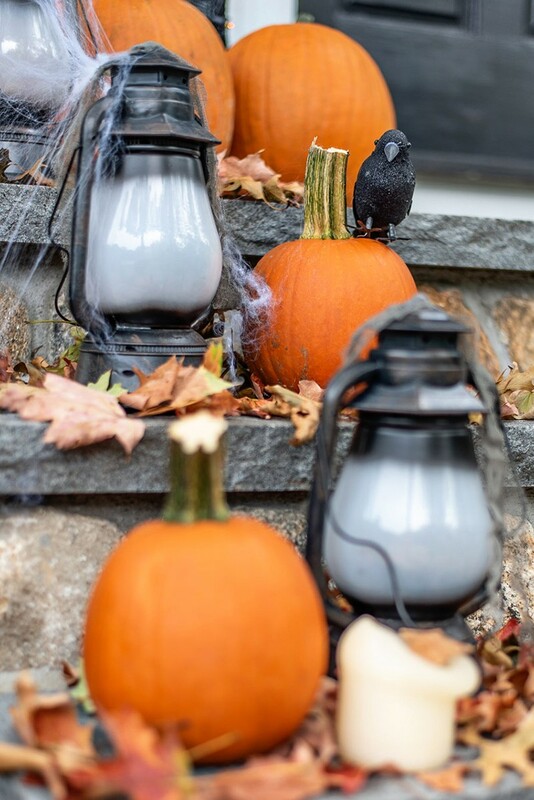 It’s perfect to hold more lanterns, fake flowers or even a bowl of candy. 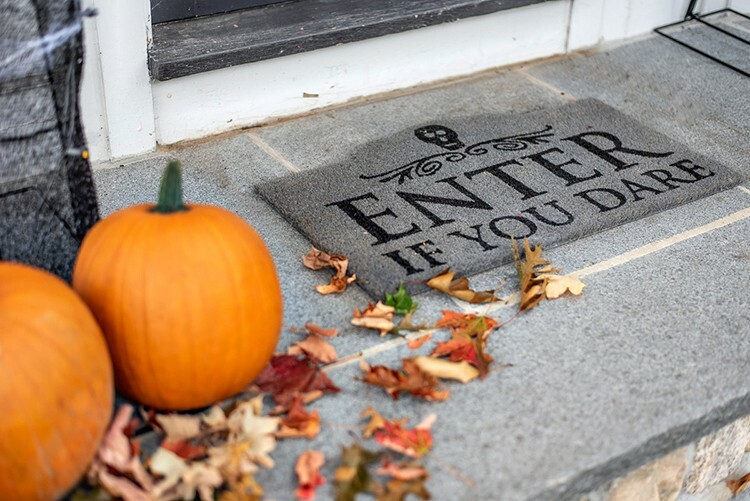 Finally, a doormat, graveyard tombstones, cobwebs (leftover from the arch) and of course real pumpkins add the finishing touches. And as fun as all of this is during the day, at night is when the magic really happens, thanks to the all the lighting props and some purple and orange alternating lights. The purple lights in particular really cast an eerie glow over everything! And the fake cobwebs look downright real at night! Spooky, right?! 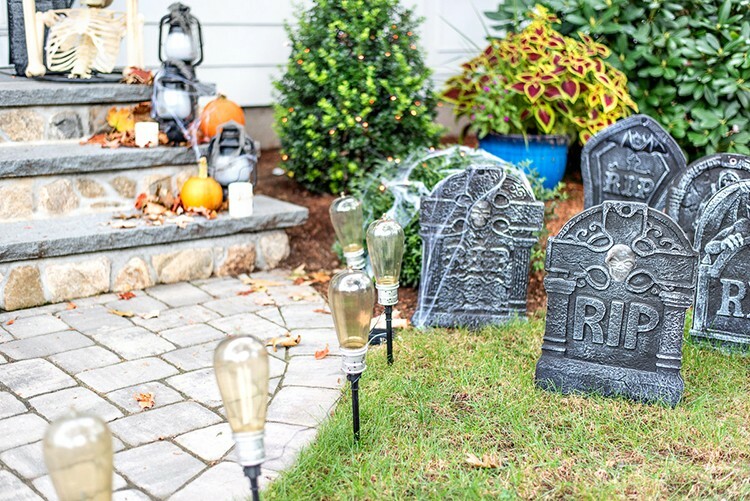 I joked to my husband that I’m glad our lawn is half dead after the hot summer we had because it really added to the vibe I was going for! By the way, if you’re thinking this whole setup looks like WAY too much effort, know that it took me less than an hour to do the entire thing. While I was setting up, I had my toddler run around the yard and find as many red and brown leaves and his good, so keep that in mind if you need to keep your kids occupies while you do it! Plus, since you can purchase all the items online from Home Depot, all you need is a photo of mine to copy so I bet it will take you even less time! If you’re a big kid like me, you’re going to love all the light and sound effects. I’m so excited for Halloween to come and to see the looks of delight (and terror!?!) on all the trick or treaters’ faces! 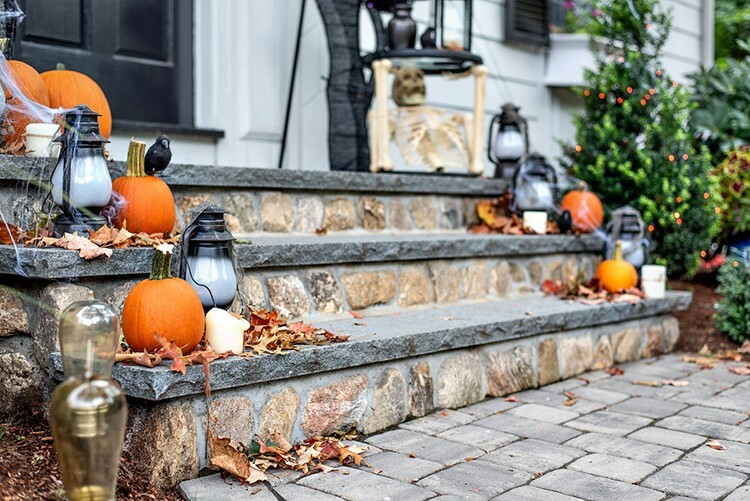 The post A Spooky Halloween Front Porch appeared first on The Home Depot Blog.